Shakespeare & Co. has announced its official opening in Bahrain. The sophisticated restaurant-café hosted an exclusive launch, “The Tea Party”, on April 10 where invited guests were treated to an extravagant afternoon of 18th century European themed entertainment and delicious food in an elegant garden party setting at the Shakespeare & Co. venue in Zallaq Springs. Immensely popular in the region, Shakespeare & Co. is known for its great quality of food, friendly and efficient service in a warm atmosphere, and exquisite Victorian era inspired décor that creates an inimitable ambience in its outlets. While every restaurant is distinctly Shakespearean, each outlet is unique in terms of colours, décor and layout. Shakespeare & Co., a UAE-based franchise with more than 50 branches in the Mena region and the US, is brought to the kingdom by Bahrain-based Rahim Holdings W.L.L. 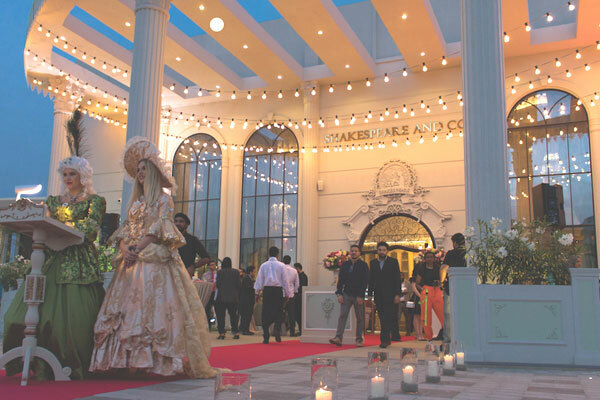 Shakespeare & Co.’s first Bahrain location is set in picturesque, flamingo-laden Zallaq Springs, where guests can choose to take a turn in the gardens and relax by the lake before enjoying their meal inside the beautiful restaurant-café. In addition to the magnificent décor and views, Bahrain’s diners can expect a refined and eclectic range of international culinary favourites, from classic comfort-food appetizers and Mediterranean-style sharers, to sophisticated European entrées, and hand-crafted desserts, pastries and chocolates, accompanied by a flavoursome selection of hot and cold beverages. There’s always something delectable to look forward to on the menu, be it breakfast, lunch, afternoon tea, or dinner. Furthermore, traditional French style patisserie with an impressive selection of pastries, vienoisserie, petit fours, macaroons and marshmallows are available for purchase from Shakespeare & Co.’s pastry counters. Artisanal home-made chocolates made with quality ingredients and individually hand wrapped in distinctive Shakespeare packaging are also on offer. Inspired by 18th century Europe, Shakespeare & Co.’s distinctive décor is designed and exquisitely crafted by the company’s own artisans to embody a by-gone era of classicism, grandeur and luxury. With careful attention to detail, delicate elements come together to create an extraordinary, transportive space that sparks the imagination and gives way to great conversation. From plush upholstery encased with antique frames, to intricate chandeliers and vintage centrepieces, the restaurant is a classically majestic, awe-inspiring union of colours, fabrics and textures that create a truly extraordinary environment.